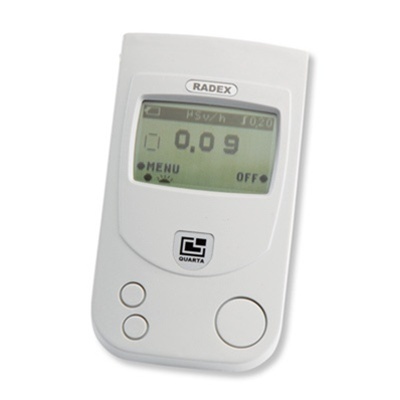 Used for determining dose rates in µSv/h for β-, γ-- and X-rays, this radiation meter can be operated by non-professionals while nonetheless offering the features of a professional dosimeter. Including two built-in Geiger-Müller counter tubes and a large, illuminated LCD display. The device measures the activity of β-and γ-particles and uses the results to calculate the dose rate. Depending on dose rate, the measurement and calculation times vary from 26 s to 1 s at high dose rates. Detection of each particle is indicated by an audio signal to facilitate searching for radioactive sources. The difference between the mean dose rate and background radiation level, as well as the background radiation level itself are displayed in the "background" mode. This facilitates, for example, inspections of enclosed spaces and building materials. Overshoot of an adjustable alarm threshold can be indicated either by an audio signal or a vibration signal. Measured values remain saved after the device has been turned off.